A persisting concern of Highgate residents is the large number of heavy lorries (HGVs) passing through the area, particularly along Highgate Hill and North Hill. One of the Forum’s members (Richard Webber) has produced a paper on this topic. The paper has been developed over several months and has now been sent to councils and resident groups. We welcome as many comments as possible so please post yours below. HGVs cannot be banned from major/designated roads – Archway Road is the example in our area (along with its northerly extensions, the Great North Road and Aylmer Road). HGVs are also permitted for deliveries, for example to construction sites, as are large public service vehicles such as dustcarts and buses. Any restriction on entering side roads (from a major road) logically gives rise to naturally occurring areas, or zones, between the major arterial roads within which, with the exceptions noted, there are meant to be no HGVs. We say “meant” as many years ago our local boroughs seem to have agreed and implemented various such HGV-free areas. The boroughs introduced the necessary traffic orders and placed appropriate signs at cordon entry points. Alas, councils have not kept all of the signage up to date – or did not place all the necessary signs in the first place. Statutory regulations change, staff move, and schemes are forgotten and, as the areas covered by restrictions often cross borough boundaries, the system has fallen into disrepair and the restriction of HGVs is no longer effective and cannot be enforced. If there are not signs at every entry point to a zone, enforcement is impossible. There are several split signs that give different weight limits for different times of day. There are redundant signs inside the cordon. The Forum wants a full reinstatement of the various cordons around Highgate and beyond. The paper uses one of Highgate’s cordons as an example of the thinking and work required. The cordon illustrated in this paper does not need much work to become effective since it is largely a matter of reinstatement – judging by the signs that are in place, the statutory regulations already exist. In other cases, where statutory regulations do not exist, it will take time for residents, local stakeholders and councils to develop a workable plan. The restoration of the missing signs and the development of new weight restriction areas will play a modest but not unimportant role in reducing congestion and pollution on our roads. Thank you for looking into this issue which I agree is increasing in concern. 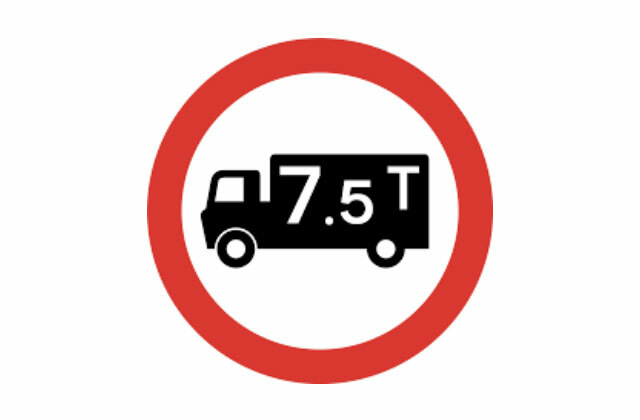 I don’t know how heavy skip trucks are, and whether they would get caught by the 7.5 ton limit when empty, but in Cromwell Avenue we have a major issue with skip trucks racing over the speed bumps in the night and early hours. It is very loud (incl when empty) and these vehicles really shouldn’t be coming down a residential street with speed bumps aside from actual collections. Very grateful if this can be included in the paper. Thanks very much for your engagement!